For better or worse, Cambodia today lives in the long shadow of its own history. On one hand, the incredible ancient history of the Khmer Empire and Angkor fuels Cambodia's contemporary development through a burgeoning tourist industry, but on the other, that development is needed only because of Cambodia's much darker and more recent history. This dichotomy is at the heart of Cambodia's post colonial conciousness, and to understand it is to understand the story and the plight of men like Sedtha Long, his brother Vuthy, and an entire generation of Cambodians. When Cambodia declared independence from France in November 1953 the country and its politics were already markedly unstable. This instability reflected not only the divisive politics of anti-colonialism, but also that of a relatively new phenomenon to South East Asia, communism. Since the end of the Second World War, Ho Chi Minh and his communist Viet Minh had led the fight against the French colonialists, and throughout that war for independence and in the post colonial ‘Indochina’ afterwards, Vietnamese communism and politics were always poised to influence and distort that of their smaller Cambodian and Laotian neighbors. Throughout the 1950s and especially in the 1960s with the Vietnam War, Cambodia’s King, Norodom Sihanouk, desperately tried to keep his country neutral to the conflicting ideologies battling it out next door, with this struggle between American backed anti-communists and Vietnamese communists coming to define his early rule over an independent Cambodia. With the Cambodian declaration of independence in 1953 the country may have been autonomous, but it wasn’t united. In the chaotic years since the end of the Second World War a number of different partisan groups had emerged in the wake of a newfound Khmer nationalism. This nationalism and the groups espousing it, which had always centered around the fight for independence from France, found themselves in lieu of a colonial power to object to instead objecting to the King or other former anti-colonial movements. On one side, the Khmer Issarak (anti-communist) guerillas who had fought the French, now stood off against the Viet Minh (communist) guerilla forces who wanted to extend the communist revolution of North Vietnam to the rest of Indochina. On the political side, a new Democratic Party had a majority in the country’s “Consultative Assembly” and made a point of their policy being in implementing a parliamentary government, which would by its nature take power away from the King. At the center of all of this was inevitably the King, Norodom Sihanouk, who from the anti colonial guerillas was accused of being a pawn of the French for his past participation with the colonial government, and from the now Democrat dominated assembly was being accused of being a despot. The way that the King was able to wiggle his way out of being trapped by either side while simultaneously keeping his power was essentially not to take a side at all. He didn’t support the communist movement in Indochina, and he didn’t support the anti communist reaction to it. He desperately kept his country from taking sides in the partition of Vietnam after the French finally withdrew in 1954, and in matters of foreign relations, he kept himself away from controversy, putting forward a policy of “extreme neutrality”. This formula, combined with the Cambodian people’s ingrained love for their King, allowed him to hold on to his country’s autonomy, it’s independence and his own power. However, as the conflicting ideas and foreign interests behind the partition of Vietnam became ever more volatile, Sihanouk’s grasp on power and neutrality grew ever more tenuous. As Sihanouk lead his country through the unstable 50s and 60s, keeping both Cambodia’s neutrality and autonomy became extremely difficult. As the Vietnam War raged next door, the North Vietnamese forces and the Viet Cong began using Eastern Cambodia to ferry supplies from North to South and as a staging ground for attacks on South Vietnam. Sihanouk’s small army combined with his unwillingness to get involved in the conflict saw him tacitly tolerate the Vietnamese presence in the country, which, as the conflict grew and the number of Vietnamese troops grew with it, became a bigger and bigger problem as time went on. Anti-Vietnamese protests sprung up throughout the country and with them a stock of newly emboldened politicians both within and without the royal family. This growing tension eventually came to a head, with the tipping point coming in 1970. While Sihanouk was out of the country in France, a number of right wing politicians, led by the defense minister, Lon Nol, riding the wave of anti-Vietnamese sentiment in the country, stripped Sihanouk from his powers, and on the 9th of October declared a Republic. There is come controversy around whether the United States was involved in the coup, but what is certain is that this new government was in every way as partisan as Sihanouk wasn’t. The United States threw their support behind this new regime, and within weeks gave the Vietnamese an ultimatum, leave or face military action. Sihanouk meanwhile brooded in fury, vowing revenge. Suddenly Cambodian politics were thrown up in the air. The Khmer Republic was born out of the 1970 coup d’etat that removed King Sihanouk from power and put it instead in the hands of his defense minister, Lon Nol. Where Sihanouk and his Kingdom of Cambodia had been hesitant to get involved in the conflict taking place throughout post-colonial Indochina, the new Khmer ‘Republic’, emboldened by American support, was all too ready to dive right in. Influenced by strong anti-Vietnamese sentiment across the country, this new government expanded its military five-fold and led an offensive against not only the Vietnamese, but communists in general. While this helped Lon Nol and his political allies solidify control over the country, in the long run it would prove to be their downfall. King Sihanouk wasn’t taking his being exiled lightly and he returned to the country to throw his support behind an obscure fringe guerilla group that stood in opposition to Lon Nol and the new Republic in the hope that he would run the future government. This group, the Khmer People’s Revolutionary Party (KPRP) or as they would later become known, the Khmer Rouge, would eventually overpower the government in Phnom Penh and on the 17th of April 1975, not even 5 years after Lon Nol took power, the Khmer Republic would fall. While King Sihanouk’s tacit support for the Vietnamese had enraged Cambodia’s educated elite, the vast majority of the country, poor rural farmers, still revered him as a “God-King”. For them, politics had little influence on their lives. Whether it was something as recent as the coup d’etat in 1970 or something as distant as colonization, the average Cambodian saw little difference in their day-to-day lives. The only thing that held constant in the average Cambodian’s world was the King, his divinity, and in turn, their love for him. Hence, when the King returned from exile to try and find a way to wrestle back power in the country, it mattered little what group he decided to put his name to. Whether it was fascists or, as it turned out, communists, Sihanouk relied on the Cambodian people to follow their King, and follow they did. Before the Khmer Rouge joined forces with Sihanouk, their number of fighters probably hovered around 5,000; after King Sihanouk put his support behind them their numbers quickly grew ten-fold. These new “Sihanoukis” came out in droves to fight for their King, and combined with military support from Vietnam and China, they were soon turning the tide against Lon Nol and his own newly enlarged military. On the side of Lon Nol and the Khmer Republic, the idea that they would be able to drive communism from Cambodia relied almost entirely on the support from the United States. The Americans had in turn been itching for an alternative to the Vietnamese-friendly Sihanouk and jumped at the opportunity to back the new ‘Republic’. This American aid came mostly in the form of money, as an expansion to the Cambodian military to the scale that Lon Nol wanted would have destroyed the economy; by the time Lon Nol was overthrown, the Khmer Republic had received around one million dollars a day in financial assistance from the United States. However, though the economic assistance was vital, it wasn’t enough. Cambodia had almost no experienced generals or officers and corruption was rampant in this newly enlarged military. Generals would report salaries for soldiers that didn’t exist and pocket the extra money, disobey orders, and towards the end of the conflict, actually sell equipment and ammunition to the Khmer Rouge they were fighting. The result was underpaid soldiers with little moral being led by corrupt generals with little or no military experience who often acted in their own interest before that of their government. Combined with the phasing out of the United States from the region as the 70s progressed, and the prospects for the Khmer Republic became dismal. They lost almost every campaign they launched, and by the start of 1975, the capital Phnom Penh was the only part of the country still controlled by Lon Nol and his government. On the 12th of April, 5 days before the capital fell, one of the last actions of the United States in South East Asia would be one of the largest heli-evacuations in history, operation Eagle Pull. In the days afterwards for the Cambodians and the few foreigners who remained, they would see the Khmer Rouge take over the capital and with it they would witness what was for many Cambodians the beginning of the end. The Khmer Rouge, or as they were originally known, the Khmers Rouges (French for Red Khmers) started out as a disjointed band of rebels in 1968, but by 1975 had brought an all encompassing communist revolution to Cambodia. This revolution, the philosophy behind it and the man running it would come to destroy Cambodia, killing a quarter of the population and rolling the country back decades. This genocide as it would later be called would be one of the worst in the 20th century and human history at large. The destruction wrought by the Khmer Rouge, the people they killed and the suffering they caused can still be felt throughout Cambodia, reverberating in the country’s government, economy and educational systems. The country was destroyed in a way rarely seen in history and to understand why and how it was even possible it’ necessary to peel back the curtain and examine the mind and philosophy of one of history’s worst monsters; Pol Pot. Pol Pot, or as he was known until 1976, Saloth Sar, didn’t come from extraordinary stock. His father had been a moderately wealthy farmer, and amongst his 8 siblings, the most remarkable was his older sister who had been a concubine to King Sisowath, Sihanouk’s father. Sar eventually made it into the prestigious lycée Sisowath in Phnom Penh, but soon flunked out and instead pursued a vocational degree. In 1949 he qualified for a scholarship to go to study in Paris and for four years he pursued radio electronics. It was while he was in Paris that he became exposed to the ideas of Marx and the French Communist Party (PCF). Sar may have failed his final exams three times while he was studying in Paris, but to him that almost didn’t even matter. The ideas of agrarian socialism that were becoming popular amongst his new circle of friends in Paris advocated the poor, uneducated farmer as the quintessential example of the proletariat, not the downtrodden industrial workers of Europe. Sar quickly transformed the Khmer Students Union in Paris into a left-wing meeting hall of sorts, with the relationships he formed among fellow Cambodians in Paris as well on trips to East Berlin and Yugoslavia becoming important and long lasting; among them were many future Khmer Rouge leaders. By the time Sar was finally forced back to Cambodia in 1953 due to his inability to pass his exams, he had made it his mission to bring about a communist revolution in Cambodia. Joining forces originally with the Viet Minh (North Vietnamese) sponsored KPRP, Sar made his way up through the ranks, and by 1968, he had taken total control of the movement and renamed it officially to the Communist Party of Kampuchea (CPK). By this time the CPK was looking to the Vietnamese, who had in the early 50s sponsored the Cambodian communist insurgency against the French, to support a contemporary fight against Sihanouk. Sihanouk was, however, tacitly cooperating with the Vietnamese, so the CPK and their maybe 200 regular members were left to try and start a guerilla war on their own. They faired as well as can be expected from a few hundred lightly armed insurgents, and though they had gained some attention (the original name Khmers Rouges was coined by Sihanouk at this time), it wasn’t until the 1970 coup d’etat that their fortunes changed. With the coup came the Republic, with that came the support of Sihanouk and his ‘Sihanoukis’ as well as the Vietnamese and their guns. It wasn’t until this time in the early 70s that Sar’s ideas, which had been up until this point mostly hypothetical, began to be implemented. 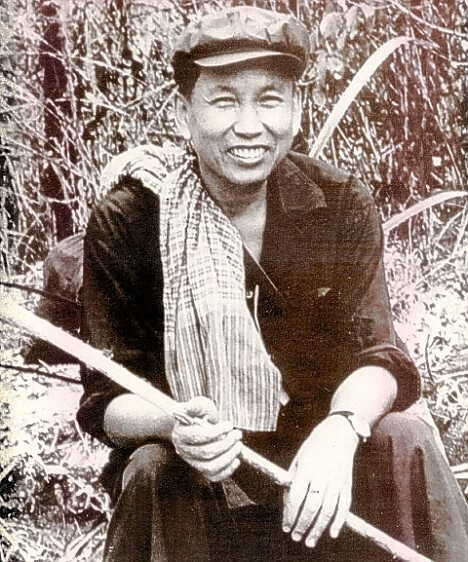 Saloth Sar, or as he would soon rename himself after taking control of the country, Pol Pot’s ideas for Cambodia can be best described as some sort of twisted Maoism. He became obsessed with the idea of the common rural farmer or laborer being the shining example of the proletariat, and he believed strongly that the best version of Cambodia is one where everyone is brought down to this level. He restricted party membership only to those who came from a poor peasant background (partly because that was the main support base for Sihanouk) and when urban towns and cities didn’t integrate into his idea of socialism, he had them evacuated and the population sent to work in the fields. This practice of breaking down society and forcing everyone to work was to Pol Pot the best way to realize the classless utopia at the center of the communist ideal. Everyone would be poor, everyone would work for the collective good, and anyone who opposed that idea had to be killed through revolutionary action. Pol Pot’s violent revolution in Cambodia was originally fuelled by the same kind of ideas behind the ‘necessity’ of any 20th century communist revolution. In order to bring about perfect communism, you had to tear down the old, capitalist system and built a socialist one in its place. In China, Russia, Cuba, Vietnam and much of the world this involved the killing off of political foes, capitalists or in some cases ‘enemies of the revolution’. Pol Pot took it to another level altogether. He believed that in a perfect Cambodia all of the people would not only find equality in collective work, but also find greatness in isolation. Cambodia and its socialist movement, in his mind, had been betrayed by the Viet Minh and their influence over the development of Cambodian communism in the early 50s, and that in order to have a pure communist utopia, it had to be totally independent of outside factors. Under this logic, anybody who had any connection with the outside world, its ideas or its history had to be destroyed. Teachers, doctors, intellectuals, monks, civil servants, people who spoke another language, people who had gone to secondary school or even people who wore glasses were hence “enemies of the revolution”. The most tragic realization of Pol Pot’s communist dream came when the Khmer Rouge finally overran the capital and claimed themselves the sovereign rulers of Cambodia. The new government of “Democratic Kampuchea” had its first action in evacuating the two million people of Phnom Penh into the countryside and declaring “Year Zero”. Year Zero was supposed to mark the new history of Cambodia under communism, with anything before that effectively not existing; the ultimate realization of Pol Pot and Khmer Rouge’s ideal of total isolationism. The borders were closed and the purge of Cambodia began. Anybody who had any connection to the outside world either through association or education over the next tragic four years would be put to death. Even in China, where the idea of agrarian socialism originated, Mao Zedong in his infamous “Cultural Revolution”, sent the educated down to the countryside to be “re-educated” in the image of the farmers and laborers. Pol Pot and his Khmer Rouge opted instead to kill them. A quarter of the population of Cambodia would die under the Khmer Rouge. On the 17th of April, 1975, the Khmer Rouge marched triumphantly into the streets of Phnom Penh, signaling the end of the civil war and the fall of the Khmer Republic. That morning, the Khmer Rouge soldiers were greeted by throngs of people filling the streets and cheering the end of the fighting, but by nightfall, most of those same people would be lost in tears. The new radically communist government of the Khmer Rouge would be called ‘Democratic Kampuchea’, and in fewer than four years, this government, and those running it, would oversee the destruction of Cambodia. Politically inept, this government would isolate itself while lashing out at its neighbors, kill its own people while praising their greatness, factionalize and ultimately drag themselves, along with the entire country, to destruction. The guiding ideas behind every facet of government were as insane and perverse as the communism they espoused, with the nation of ‘Democratic Kampuchea’ going down in history as one of the most dysfunctional, brutal and tragic states to ever exist. The word Kampuchea in ‘Democratic Kampuchea’ is actually the original word that Cambodians used to refer to their own country in the Khmer language, whereas “Cambodge” or as it is known in English, Cambodia, was a word made up by French colonialists. The usage of Kampuchea by Pol Pot and his Khmer Rouge, both before and after seizing power, was not done by accident. It mustered up patriotic and nationalistic ideas about Khmer culture, history and greatness, something which Pol Pot tried very hard to exploit. He advocated the greatness of the Khmer people, their infallibility and their superiority, especially in comparison to their better-known Vietnamese neighbors. This nationalistic attitude not only found its implementation in Cambodian isolationism, but also in open hostility towards the Vietnamese. In one fiery decree, he bragged, “Cambodian soldiers are worth thirty Vietnamese”. This hostility and at times outright racism worked for Pol Pot as it had for Lon Nol in rallying support around anti-Vietnamese sentiment in the country, and like his predecessors, Pol Pot used this to exploit national pride in order to solidify power around himself. This first manifested itself first in aggressive speeches, then border raids into Vietnam, and eventually, once the Vietnamese had had enough, the invasion that ended the Khmer Rouge’s short, brutal and disastrous rule of the country. 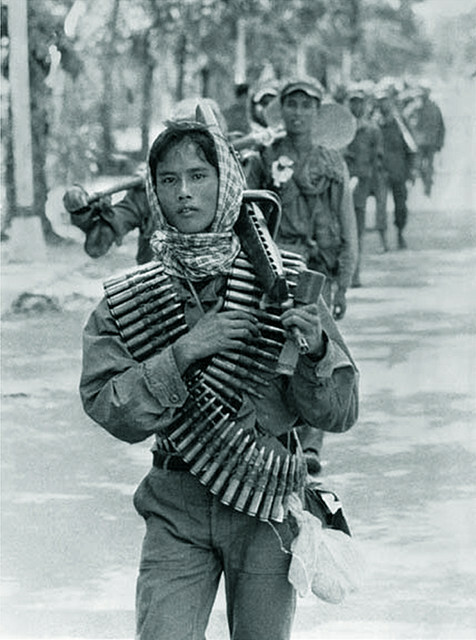 The first communist insurgents in Cambodia were originally agents of the Indochinese Communist Party (ICP), or as they were better known, the Viet Minh. These Khmer communists in the early 50s were part of Ho Chi Minh's effort to end colonialism throughout French Indcochina and bring the entire region under communist leadership. Fortunately or unfortunately, Ho Chi Minh succeeded in only bringing North Vietnam under his socialist vision, and as the newly empowered King Sihanouk acquiesced to Vietnamese interests, the connection between North Vietnam and their Khmer satellites waned. Pol Pot would eventually step into this vacuum and take the movement in a decidedly anti-Vietnamese route, but in the core leadership Vietnamese sympathies would persist, even as old 'Viet Minh' members rose in the ranks of the new government of "Democratic Kampuchea". These views stood in stark contrast to Pol Pot's fiery isolationist and anti-Vietnamese rhetoric, and as Pol Pot's influence over the country grew more tenuous and the Khmer Rouge leadership factionalized, there would be a significant group within the Khmer Rouge that would encourage and ultimately invite a Vietnamese invasion. The Vietnamese invasion of Cambodia would come in late 1978 and early 1979 and would last about as long as it took the Vietnamese tanks to drive to Phnom Penh. The Khmer Rouge as an organized military force were as dysfunctional as they were a government and offered very little resistance to an organized and experienced force like that of the Vietnamese military. Pol Pot and a significant number of supporters would flee back into the jungles from whence they came and return to their guerrilla style of warfare, selling themselves as an alternate government to the Vietnamese and beginning what would become another prolonged civil war. While Pol Pot and loyal Khmer Rouge would fight the change, the pro-Vietnamese and politically savvy members of the now former government would find themselves entrusted with leading a post Khmer Rouge Cambodia. These new Cambodian leaders under yet another Cambodian government would in reality be little more than custodians over a country dominated by Vietnam, but as a group they would prove much more flexible to changing political environments. When the Vietnamese eventually left, those who had been in power would hold on to it and never let go, with the contemporary Prime Minister and most of his cabinet today tracing their lineage back to the failed government of Democratic Kampuchea and the communist insurrection that preceded it. The invasion would end the political rule for "Democratic Kampuchea", but would by and large not end the suffering for the Cambodian people. The Vietnamese and their communism was only marginally better than the Khmer Rouge, and in this new government that was little more than a Vietnamese client state, the crimes perpetuated by Pol Pot and his government wouldn't come to light for more than a decade. The fall of the Khmer Rouge in 1979 to the Vietnamese brought down one of the most autocratic, brutal and disastrous regimes of the 20th century, but did not necessarily coincide with a liberation of the Cambodian people who had suffered under it. Many people like Sedtha, and what was left of his family, would end up living in refugee camps for more than a decade, exiling themselves from their own country. These people fled not only the remnants of the Khmer Rouge and the civil war they would incite, but they also fled persecution from the Vietnamese and the generally anarchical society that prospered under them. Organized crime and black markets would flourish in the city centers whereas banditry would run rife in the countryside, making a return to normal day-to-day life under this new Vietnamese government very difficult for the Cambodian people. The end to this would supposedly come with UN sponsored elections and a transition towards democracy in the early 90s. However, like many of the promises given to the Cambodian people over the preceding 50 years, this one would turn out to be mostly empty as well. Cambodia’s government today can hardly be described as democratic, with its ingrained leadership and corruption standing as a barrier to both the country’s ability to reconcile itself with the past and move forward into the future. Contemporary Cambodian politics are very unique in how heavily they are anchored to the past. The Cambodian People’s Party, which dominates Cambodia today, fields one of the longest ever non-royal national leaders in the world. At just over 30 years in power, only African dictators like Mugabe or the Iranian Ayatollah Khamenei eclipse Hun Sen, the Prime Minister of Cambodia, in time spent in office. He has overseen three separate governments, and throughout it all remains one of the only threads connecting today’s Cambodia to the fall of the Khmer Rouge and “Democratic Kampuchea” in 1979. Hun Sen was a member of the Khmer Rouge, and then after the fracturing of its leadership, a leader amongst the pro-Vietnamese dissidents. These pro-Vietnamese dissidents had, after the Vietnamese invasion, consolidated themselves symbolically around a renewed KPRP, which was the name associated with Khmer communists before Pol Pot had taken over the movement. They did this, in their own words, in order “to clearly distinguish it from the reactionary Pol Pot party and to underline and reassert the continuity of the party's best traditions”. This new KPRP, under its own “best traditions”, was nominally a Marxist-Leninist party, and upon its founding had named Hun Sen foreign minister, and soon afterwards in 1985 it would name Hun Sen Prime Minister. This country that the KPRP had inherited and now Hun Sen, at the age of 32, ran was the “People’s Republic of Kampuchea” (PRK) and though they were fairly secure in their political rule within Cambodia, international recognition was not as forthcoming. Due to the fracturing of the Khmer Rouge leadership both before and after the Vietnamese occupation, when Pol Pot retreated back into the Cambodia’s dense jungles, there were few supporters who followed him. This remaining loyal Khmer Rouge would instigate a renewed guerilla war, but in terms of domestic political relevance within Cambodia, the Khmer Rouge became a shell of what they had been. This was a completely different story, however, on the international stage. In the eyes of the United States and much of the Western world, the only thing worse than a Cambodian communist government was a Cambodian communist government dominated by the Vietnamese. Hence, when this new Vietnamese sponsored government of “The People’s Republic of Kampuchea” (PRK) looked to the international community to recognize their government, they were met with disdain. This was epitomized by how Cambodia’s seat at the UN would, throughout the PRK's reign, remain represented by the Khmer Rouge. It would be same story with many country’s own diplomatic ministries, with ambassadors and embassies of Pol Pot’s “Democratic Kampuchea” being recognized, in lieu of Hun Sen’s People’s Republic, as legitimate. This gave the Khmer Rouge political weight, and when an alternative government coalition formed to stand in opposition to the People’s Republic and the Vietnamese, the Khmer Rouge became an instrumental part of it, despite both their own irrelevance on the ground and their egregious crimes against humanity. The coalition movement, which stood in opposition to the “People’s Republic”, had three main players. The Khmer Rouge, still led by Pol Pot, the Khmer People’s National Liberation Front (KPNLF), led by a banker and ex Prime Minister under Sihanouk, and FUNCINPEC, a new political party led by Sihanouk himself. Each had its own armed wing fighting the PRK, but their leadership was able to form a loose coalition which collectively drew support from the international community and demanded democratic elections. It would take more than a decade, but finally in 1992, the government of Cambodia under Hun Sen agreed. Over the ensuing year, the United Nations would spend more than $2 billion and take the unprecedented action of forming the United Nations Transitional Authority in Cambodia (UNTAC). Whereas the UN had only before ever acted to supervise or monitor elections, UNTAC would effectively act as a government itself in order to ensure the transparency of the upcoming Cambodian election. When the election actually took place in May of 1993, 90% of eligible voters would go the polls to vote in what was probably Cambodia’s first (and maybe last) fair election. When all the dust finally settled, Prince Ranariddh, Sihanouk’s son, of the FUNCINPEC party had won the election. However, with just under 46% of the vote, he hadn’t won a majority. Hun Sen, and his brand new Cambodian People’s Party (replacing the KPRP) was livid at the prospect of losing power, and threatened to split the country if Ranariddh assumed leadership. Sihanouk, returning to his country again from exile, wanted anything but another civil war and instead proposed to form a coalition government where Prince Ranariddh and Hun Sen would share power. In this new constitutional monarchy, where Sihanouk would be able to sit as the symbolic King, there would co ministers for everything in the government. Ranariddh and Hun Sen would be co-prime ministers, and across every ministry from interior to health, there would be two, often politically divergent, ministers. This power sharing agreement between Hun Sen and his CPP and Ranariddh and his FUNCINPEC was fragile to say the least. Hun Sen was highly paranoid of Ranariddh, fearing that he was consistently plotting to throw him and his CPP out of government. When Ranariddh ordered arms for his personal bodyguard or took military action against the ever-rebellious Khmer Rouge, Hun Sen feared that it was all a rouse that was ultimately intended to consolidate power around Ranariddh personally. The story was the same throughout the government, with the still largely communist CPP ministers and the decidedly non-communist FUNCINPEC ministers often developing personal rivalries and growing ever more paranoid of each other. This tension would reach its head in 1997 when Hun Sen decided it was time to take action. The military under this new government was for all intents and purposes the same that had existed under the PRK, and hence the generals and officers had remained loyal to Hun Sen before this new, UN sponsored government. Hun Sen knew this and exploited it, driving Ranariddh and his FUNCINPEC from all aspects of government, killing some 40 FUNCINPEC officials and driving others, including Ranariddh himself, into exile. Some FUNCINPEC officials would return a year later to participate in the 1998 elections, but with Hun Sen in power, the CPP was able to use as much political violence, media censorship and intimidation as they needed to in order to win, and win they did. The story would be largely the same in all ensuing elections, with Hun Sen and his CPP doing whatever they must to keep themselves in power.